Andy Murray maintains his belief that he can win Wimbledon this year after an incredible fightback from two sets down to beat Richard Gasquet on Monday. Gasquet served for the match in the third set but Murray recovered to win 5-7 3-6 7-6 (7-3) 6-2 6-4 and seal a quarter-final against Rafael Nadal. The Briton thrilled the Centre Court crowd with victory in four hours. And asked if he felt he could win the title, he said: "I felt like that since the start of the tournament." The 21-year-old Scot, who was seeking a first-ever place in a Grand Slam quarter-final, had been in desperate trouble when the eighth-seeded Gasquet took command of the first two sets. "For pretty much the first three sets he completely outplayed me," said Murray, who had only dropped one set in his three previous matches before Monday's clash. "And then as soon as the pressure did start to get to him a little bit at the end of the third set, I obviously took advantage of it and came back well. "The end of the match was absolutely awesome. It was nearly pitch black but one of the best matches ever for sure, for me." 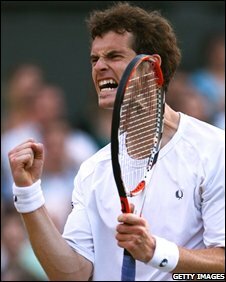 The match moved dramatically in Murray's favour when he secured the third set tie-break with an outrageous backhand winner from way outside the tram lines. "That was obviously huge," he said. "To finish a set like that really got the crowd going and shifted the momentum hugely. "His head went down a little bit for a few games after that shot." 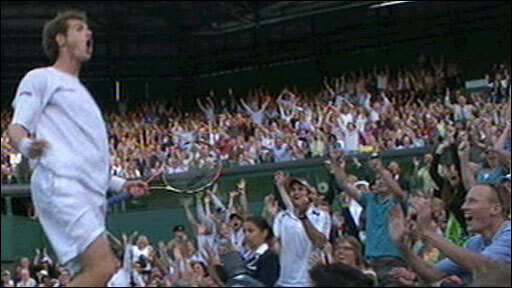 And Murray admitted he had been lifted by the vociferous support of the 15,000 spectators on Centre Court. "The crowd were awesome. The whole tie-break and the fourth and fifth sets, once I got ahead they got behind me more than they ever have before. "He obviously tired at the end of the match and it almost takes your mind off your physical state when you've got so many people behind you. "I thought they made a big difference in the end, for sure." Next up for Murray on Wednesday is arguably the toughest challenge in tennis at the moment as he takes on the in-form Nadal, whom he has yet to beat in three meetings. "I'm going to have to try and recover really well, get enough food in me, enough sleep, and try and prepare the best that I can," said Murray. "Obviously he's the favourite for the match but I do think I can win. "When I have played him in the past on faster courts I have had chances against him, and I am definitely a better player than I was before and definitely fitter. "It is going to be really important to serve well again but if I do that there is no reason why I can't win." Gasquet, who reached the semi-finals last year, admitted that his confidence had drained away after he failed to see out the match in the third set. "I was winning two sets to love and 5-4, so I had to win," said the Frenchman. "But he fought a lot. And after, when I lost the third, my confidence was down. "He played better. He served better. He returned better. The crowd was for him. It was natural. But it helped Andy a lot, for sure." The 22-year-old did not blame the conditions for his defeat but felt the match could have been suspended earlier. "I understand they want to finish the match because it's better for Wimbledon, but maybe, yes," he said. "But that's not an excuse. He won the match. He played well. He fought a lot. I'm sure he fought more because he was in Wimbledon, so it was maybe the key. "He played with the crowd. It was difficult for me when I lost the third. But in the fourth and the fifth he returned better than me. It was maybe the key. He served and returned better than me." And Gasquet is keen to see the roles reversed one day at the French Open. "I hope to play against him in Roland Garros for sure," he joked. "I won't be alone this time. So I'm waiting (for) him." Does the crowd affect the result?